"If we are to understand dynamics of bacterial-host cell interactions, we need to investigate the intimate adaptations at the cellular and molecular levels"
Welcome to my personal website. 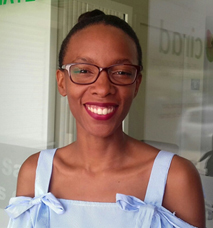 I am a research scientist at CIRAD in the Caribbean Research Centre for Vector-borne diseases (approx. 20 people). We are located on the INRA campus in Petit-Bourg, Guadeloupe and we are part of the ASTRE research unit based in Montpellier. I have worked on numerous whole genome sequencing projects and functional genomics projects for Xanthomonas campestris pv. campestris, X. c. pv. raphani, X. oryzae pv. oryzae, X. o. pv. oryzicola and Ehrlichia ruminantium. My current research interests are directed toward understanding the biology host-intracellular bacteria interactions. Bacterial pathogens and symbionts exploit a wide array of strategies to facilitate interaction with hosts. For endosymbiotic or intracellular pathogenic bacteria, there is a constant need to manipulate signaling pathways in the eukaryotic mammalian or arthropod host cell. 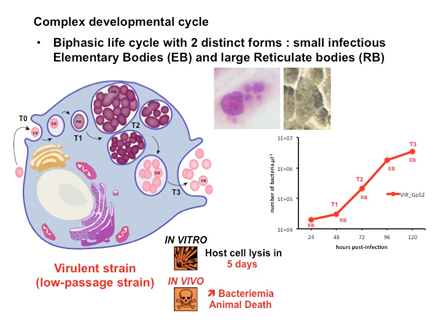 I am particularly interested in the pathways used by intracellular pathogenic Ehrlichia bacteria to enter host cells and create a safe replicating niche. I am also investigating how endosymbiotic Wolbachia bacteria interact with eukaryotic cells. My research encompasses the underlying molecular mechanisms of these processes and the illumination of how these strategies facilitate unique interactions with the host immune system, most notably for immune evasion. To this aim, I use a systems biology approach that goes from molecular and cellular biology to translational studies with particular emphasis on the interface between the bacterium and its host (vertebrate and invertebrate ; unicellular or multicellular). The unifying theme is the integrated study of infectious strategies of Anaplasmataceae (pathogenic Ehrlichia and symbiotic Wolbachia) in conjunction and communication with each other, their host, and the cellular environment they inhabit. Findings from this work contribute to understanding the mechanisms of pathogenesis and endosymbiosis as well as advancement of human and animal health interests. This site contains a more detailed description of my research projects at CIRAD, an introduction to people working with me, reprints of all of my publications, and other useful links. My research focus is on how the obligate tick-borne intracellular pathogen Ehrlichia ruminantium (Anaplasmataceae family) manipulates cellular function in order to multiply inside host cells and cause infectious disease. 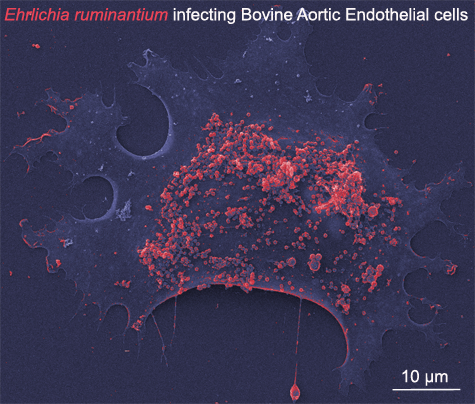 Heartwater disease caused by E. ruminantium is generally fatal on ruminants and is common in sub-Saharan Africa and in some Caribbean islands. Some human cases have been reported in South Africa. The clinical signs of heartwater (also known as cowdriosis) are caused by an increased vascular permeability and consequent œdema. The symptoms include neurological signs (tremors), respiratory signs (coughing) and systemic signs (fever, loss of appetite). In the host, E. ruminantium infects endothelial cells and neutrophils, where the pathogen replicates to high numbers in an intracellular vacuole. Ehrlichia produces a Type IV Secretion System (T4SS) to deliver proteins into the host cytoplasm where they can manipulate the host cell machinery and subvert host innate immunity. However, due to a lack of methods for genetic manipulation of the bacterium, Ehrlichia virulence factors remain largely unknown. Using bioinformatics, genomics, proteomics, cellular and molecular biology approaches, we aim to identify E. ruminantium T4SS substrates and their host targets. How does E. ruminantium attach to host cell and subvert host cell signaling pathways to establish a safe replicating vacuole ? 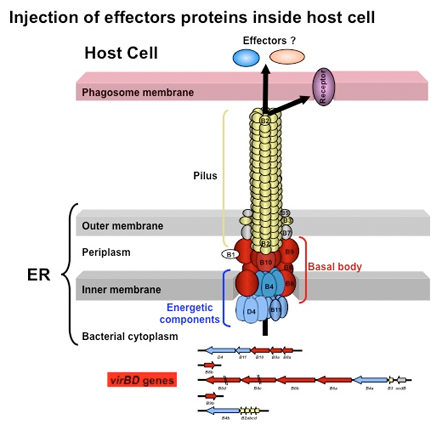 How does E. ruminantium exit host cells and disseminate within a host ? Which mechanisms govern E. ruminantium host specificity ? Our studies will provide information about the molecular arsenal used by E. ruminantium and other Anaplasmataceae for successful development inside its host cell. We are also studying the impact of these bacteria on host cells signaling. Altogether, our research will give new insights on the intimate interaction of Anaplasmataceae with their mammalian or tick host cells and will foster the development of new anti-bacterial molecules. Intracellular pathogens have evolved numerous strategies for promoting their entry into host cells, consistent with its essential role in pathogenesis. Yet despite its fundamental importance, Ehrlichial entry remains a largely unexplored research area. Using microscopy and proteomics, we are characterizing outer membrane proteins involved in E. ruminantium early attachment to host cell and decoy of innate immunity. 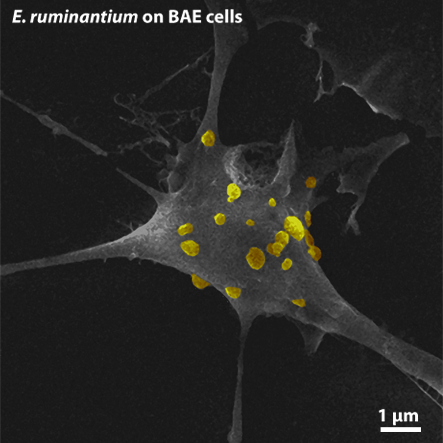 Pseudo-colored scanning electron micrograph of E. ruminantium attaching to the surface of BAE cells ultimately leading to bacterial invasion. We are investigating the role of the Type IV Secretion System of E. ruminantium in bacterial adaptation to the host cell. We want to know how it is expressed along developmental cycle of E. ruminantium between strains of various virulence. We developed S4TE, a bioinformatic tool in Perl to predict Type IV Secreted Effector proteins of E. ruminantium and to analyse their genomic context. Using molecular and cell biology tools, we are characterizing the function of these effectors. E. ruminantium is also capable of escaping host cells by lysis of its resident vacuole and host plasma membranes, followed by subsequent release of free bacteria into the extracellular compartment. For obligate intracellular pathogens, lysis is a biological process that is tightly regulated. We are using functional genomics and cellular biology to identify key players and signaling pathways involved in this process. Stephanie grew up in Guadeloupe and went to College at Université des Antilles, Pointe-à-Pitre, where he studied bioinformatics. After working as research assistant, she joined the group first in 2017 to work on the genetic manipulation of Ehrlichia ruminantium in the frame of a patent consolidation (SATT AxLR grant). Now, using our brand new S4TE2.0 software and cellular biology, Stephanie is studying the molecular determinants of Anaplasmataceae pathogenicity, particularly through the functional characterization of type IV effectomes. Her work should lead to the development of alternative strategies to fight against intracellular pathogenic bacteria and other vector-borne pathogens. Christophe grew up near Dijon in East of France (capital of Burgundy, famous region for its wine, beef, mustard and snails !) and went to college at Université Paul Sabatier, Toulouse where he studied bioinformatics. He joined the group first in 2012, then in 2014, to develop S4TE 1.0 and 2.0 versions. Now, Christophe is studying bacterial genome plasticity and its link with virulence. Christophe is the father of a wonderful little dog named Joy ! With 5 scientific articles and 2 patents, Chris successfully graduated from the Université des Antilles, Pointe-à-Pitre in May 2018. He is now the CEO of DATA, a startup in Bioinformatics and Software development. Finger crossed for this new adventure. After great achievements on S. cerevisiae and Xanthomonas spp., Jonathan came in our lab to work on Ehrlichia comparative genomics. Jonathan’s wonderful work led to a better understanding of Ehrlichia genetic secrets. During his stay in Guadeloupe, Jonathan also perfected his free diving technique to show us astonishing videos… another way to become a world celebrity ! Adela defended her Ph.D. on Anaplasma spp. at the University of Minnesota and came in our lab to work on Ehrlichia molecular pathogenesis. She identified critical bacterial genes involved in the infection process of mammalian host cells. Adela won the Young Scientist Award at the TTP8 Conference (24 to 29 August 2014 in Cape Town, South Africa) for her major scientific contribution on the research on Anaplasmataceae . Amal grew up in Toulouse in South West of France (famous region for its foie gras and rugby team) and went to college at Université Paul Sabatier, Toulouse where she studied plant biology and microbiology. She joined the group in the fall of 2011. Amal worked in identifying effector proteins of E. ruminantium Type IV Secretion System (T4SS) and their role inside the host cell for Ehrlichial invasion. She also characterized the outer membrane proteome of E. ruminantium. Finally, she proved that under specific environmental conditions, a new regulatory protein co-regulated the map and virBD genes, encoding outer membrane proteins and the T4SS, respectively. The aim of her thesis was to better comprehend the intimate nature of E. ruminantium interaction with the host cell. Amal was the responsible of the events committee of the lab and a huge supporter of Toulouse rugby team ! Amal successfully graduated from the Université des Antilles et de la Guyane, Pointe-à-Pitre in January 2015. We wish her a great scientific career. After a first successful stay in our lab for the development of S4TE 1.0 software, Christophe came back for the implementation of S4TE 2.0. This new version of S4TE software shows a killer web-based graphical user interface and brand new useful features (e.g. comparative genomics). 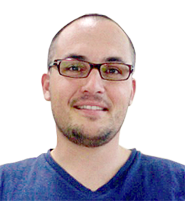 Christophe graduated from the Université Paul Sabatier, Toulouse in 2012, and joined our lab to gain bioinformatics research experience and further pursuits to become a engineer in bioinformatics. Between January and June 2012, Christophe sought to develop S4TE (Searching Algorithm for Type IV secretion system Effector proteins ) 1.0 software, a tool for Type IV effectors prediction and genomic context analysis. Christophe is also a cooking super star. Catherine goes by “Cathy“ was a technician in our group from September 2009 to August 2010. She was the very first member of the group, and helped to set it up and get things running. She drove the T4SS expression study in E. ruminantium and helped mentoring students. Cathy left our lab to pursue her career at CIRAD, Montpellier. She is now lab technician and responsible for metrology inside AMAP research unit. Cathy brought fashion into the lab. Remi graduated from the Université Paul Sabatier, Toulouse in 2010, and joined our lab to gain lab research experience and further find a position as lab engineer. Between January and July 2010, Remi worked with Cathy on the T4SS expression study in E. ruminantium. Remi is a dedicated football (soccer) supporter and has impressive comics drawing skills. !!! Featured on Frontiers in Cellular and Infection Microbiology website !!! 26. Cangi, N., Gordon, J., Bournez, L., Pinarello, V., Aprelon, R., Huber, K., Lefrancois, T., Neves, L., and Meyer, D.F. and Vachiéry, N. (2016) Recombination is a major driving force of genetic diversity in the Anaplasmataceae Ehrlichia ruminantium. Frontiers in Cellular and Infection Microbiology, 6:111, http://dx.doi.org/10.3389/fcimb.2016.00111. 25. Tago, D., and Meyer, D.F. @ (2016) Economic Game Theory to Model the Attenuation of Virulence of an Obligate Intracellular Bacterium. Frontiers in Cellular and Infection Microbiology, 6:86, http://dx.doi.org/10.3389/fcimb.2016.00086. 24. Yao, J., Saenkham, P., Levy, J., Ibanez, F., Noroy, C., Mendoza, A., Huot, O., Meyer, D.F., and Tamborindeguy, C. (2016) Interactions ‘Candidatus Liberibacter solanacearum’ – Bactericera cockerelli : haplotype effect on vector fitness and gene expression analyses. Frontiers in Cellular and Infection Microbiology, 6:62, http://dx.doi.org/10.3389/fcimb.2016.00062. 23. Moumene, A., and Meyer, D. F.@. (2016) Ehrlichia ’s molecular tricks to manipulate their host cells. Microbes and Infection, Volume 18, Issue 3, March 2016, Pages 172-179, ISSN 1286-4579, http://dx.doi.org/10.1016/j.micinf.2015.11.001. 22. Villar, M., Ayllón, N., Kocan, K. M., Bonzón-Kulichenko, E., Alberdi, P., Blouin, E.F., Weisheit, S., Mateos-Hernández, L., Cabezas-Cruz, A., Bell-Sakyi, L., Vancová, M., Bílý, T., Meyer, D.F., Sterba, J., Contreras, M., Rudenko, N., Grubhoffer, L., Vázquez J., de la Fuente, J. (2015) Identification and Characterization of Anaplasma phagocytophilum Proteins Involved in Infection of the Tick Vector, Ixodes scapularis. PLOS ONE, 10.1371/journal.pone.0137237. 21. Moumene, A., Marcelino, I., Ventosa, M., Gros, O., Lefrancois, T., Vachiery, N., Meyer, D. F.*@ and and Coehlo AV*. (2015) Proteomic Profiling of the Outer Membrane Fraction of the Obligate Intracellular Bacterial Pathogen Ehrlichia ruminantium. PLOS ONE,10.1371/journal.pone.0116758. 18. Marcelino I*, de Almeida AM*, Ventosa M, Pruneau L, Meyer DF, Martinez D, Lefrançois T, Vachiery N and Coelho AV. (2012) Tick-borne diseases in cattle : applications of Proteomics to develop new generation vaccines. Journal of Proteomics, 75 : 4232-4250. 17. Marcelino I*, de Almeida AM*, Brito C, Meyer DF, Barreto M, Sheikboudou C, Franco CF, Martinez D, Lefrançois T, Vachiery N, Carrondo MJT, Coelho AV and Alves PM. (2012) Proteomic analyses of Ehrlichia ruminantium highlight differential expression of MAP1-family proteins. Veterinary Microbiology, 156 (2012) 305–314. 16. Pruneau L*, Emboule L*, Gely P, Marcelino I, Mari B, Pinarello V, Sheikboudou C, Martinez D, Daigle F, Lefrançois T, Meyer DF*@ and Vachiery N*@. (2011) Global gene expression profiling of Ehrlichia ruminantium at different stages of development. FEMS Immunology and Medical Microbiology, 64(1):66-73. 15. Pilet H, Vachiery N, Berrich M, Bouchouicha R, Durand B, Pruneau L, Pinarello V, Saldana A, Carasco-Lacombe C, Lefrançois T, Meyer DF, Martinez D, Boulouis H-J and Haddad N. (2011) A new discriminatory typing technique for the Rickettsiales Ehrlichia ruminantium : Multiple-Locus Variable Number Tandem Repeat Analysis. Journal of Microbiological Methods, 88 (2012) 205–211. 14. Bogdanove AJ, Koebnik R, Lu H, Furutani A, Angiuoli SV, Patil PB, Van Sluys MA, Ryan RP, Meyer DF, Han SW, Aparna G, Rajaram M, Delcher AL, Phillippy AM, Puiu D, Schatz MC, Shumway M, Sommer DD, Trapnell C, Benahmed F, Dimitrov G, Madupu R, Radune D, Sullivan S, Jha G, Ishihara H, Lee SW, Pandey A, Sharma V, Sriariyanun M, Szurek B, Vera-Cruz CM, Dorman KS, Ronald PC, Verdier V, Dow JM, Sonti RV, Tsuge S, Brendel VP, Rabinowicz PD, Leach JE, White FF, Salzberg SL. (2011) Two New Complete Genome Sequences Offer Insight into Host and Tissue Specificity of Plant Pathogenic Xanthomonas spp. Journal of Bacteriology, 193 (19) : 5450-64. 12. Hajri A, Meyer D, Delort F, Guillaumès J, Brin C and Manceau C. (2010) Identification of a genetic lineage within Xanthomonas arboricola pv. juglandis as the causal agent of vertical oozing canker of Persian (English) walnut in France. Plant Pathology, 59 : 1014–1022. 11. Adakal H, Stachurski F, Konkobo M, Zoungrana S, Meyer DF, Pinarello V, Aprelon R, Marcelino I, Alves PM, Martinez D, Lefrancois T, Vachiéry N. (2010) Efficiency of inactivated vaccines against heartwater in Burkina Faso : impact of Ehrlichia ruminantium genetic diversity. Vaccine, 23 ;28(29):4573-80. 10. Ahoussou S, Lancelot R, Sanford B, Porphyre T, Bartlette-Powell P, Compton E, Henry L, Maitland R, Lloyd R, Mattioli R, Chavernac D, Stachurski F, Martinez D, Meyer DF, Vachiery N, Pegram R,Lefrançois T. (2010) Analysis of Amblyomma surveillance data in the Caribbean : lessons for future control programmes. Veterinary Parasitology, 10 ;167(2-4):327-35. 9. Raliniaina M*, Meyer DF*@, Pinarello V, Sheikboudou C, Emboulé L, Kandassamy Y, Adakal H, Stachurski F, Martinez D, Lefrançois T, Vachiéry N@. (2010) Mining the genetic diversity of Ehrlichia ruminantium using map genes family. Veterinary Parasitology, 10 ;167(2-4):187-95. 8. Emboulé L, Daigle F, Meyer DF, Mari B, Pinarello V,Sheikboudou C, Magnone V, Frutos R, Viari A, Barbry P, Martinez D, Lefrançois T, Vachiéry N. (2009) Innovative approach for transcriptomic analysis of obligate intracellular pathogen : selective capture of transcribed sequences of Ehrlichia ruminantium. BMC Molecular Biology, 24 ;10:111. 7. Adakal H, Meyer DF, Carasco-Lacombe C, Pinarello V, Allègre F, Huber K, Stachurski F, Morand S, Martinez D, Lefrançois T, Vachiery N, Frutos R. (2009) MLST scheme of Ehrlichia ruminantium : genomic stasis and recombination in strains from Burkina-Faso. Infection, Genetics and Evolution, 9(6):1320-8. 5. Darsonval A, Darrasse A, Meyer D, Demarty M, Durand K, Bureau C, Manceau C, Jacques MA. (2008) The Type III secretion system of Xanthomonas fuscans subsp. fuscans is involved in the phyllosphere colonization process and in transmission to seeds of susceptible beans. Applied and Environmental Microbiology, 74(9):2669-78. 4. Blanvillain S*, Meyer D*, Boulanger A, Lautier M, Guynet C, Denancé N, Vasse J, Lauber E, Arlat M. (2007) Plant carbohydrate scavenging through TonB-dependent receptors : a feature shared by phytopathogenic and aquatic bacteria. 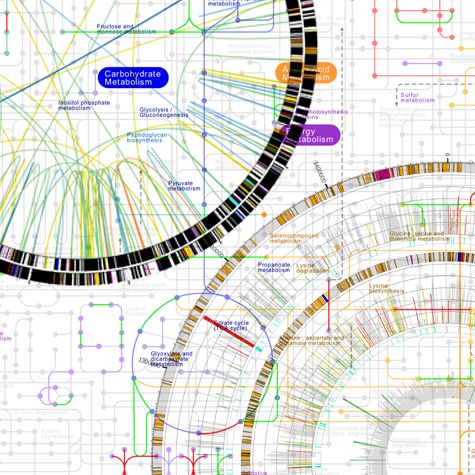 PLOS ONE, 2007 21 ;2(2):e224. 3. Meyer D, Cunnac S, Guéneron M, Declercq C, Van Gijsegem F, Lauber E, Boucher C, Arlat M. (2006) PopF1 and PopF2, two proteins secreted by the type III protein secretion system of Ralstonia solanacearum, are translocators belonging to the HrpF/NopX family. Journal of Bacteriology, 88(13):4903-17. 2. Meyer D, Lauber E, Roby D, Arlat M, Kroj T. (2005) Optimization of pathogenicity assays to study the Arabidopsis thaliana-Xanthomonas campestris pv. campestris pathosystem. Molecular Plant Pathology, 1 ;6(3):327-33. 1. Poussier S*, Thoquet P*, Trigalet-Demery D, Barthet S, Meyer D, Arlat M, Trigalet A. (2003) Host plant-dependent phenotypic reversion of Ralstonia solanacearum from non-pathogenic to pathogenic forms via alterations in the phcA gene. Molecular Microbiology, 49(4):991-1003. 1. Blanvillain S*, Meyer D, Déjean G, Boulanger A, Lautier M, Guynet C, Denancé N, Vasse J, Lauber E* and Arlat M*. (2008) Plant carbohydrate scavenging through TonB-dependent receptors by the phytopathogenic bacterium Xanthomonas campestris pv. campestris. In Biology of Plant‐Microbe Interactions, Volume 6. M. Lorito, S. L. Woo, and F. Scala, eds. International Society for Molecular Plant-Microbe Interactions, St. Paul, MN. Noroy C and Meyer DF. (2016) Searching Algorithm for Type IV secretion system Effector proteins (SATE) version 1.4. This software has been registered with the "Agence pour la Protection des Programmes (APP)" for version 1.4 under registration number IDDN.FR.001.310023.001.S.P.2012.000.31230, filled March 2016. Noroy C and Meyer DF. (2012) Searching Algorithm for Type IV secretion system Effector proteins (SATE) version 1.0. This software has been registered with the "Agence pour la Protection des Programmes (APP)" for version 1.0 under registration number IDDN.FR.001.310023.000.S.P.2012.000.31230, filled June 2012. I am located in the Caribbean Observatory of the Joint Research Unit "Control of Emerging and Exotic Animal Diseases" on the Duclos campus at CIRAD, Petit-Bourg, Guadeloupe. I am always interested in hearing from prospective graduate students, postdocs and fellows. I am part of a growing nexus of research in microbial pathogenesis, infectious diseases and global health in Montpellier and Guadeloupe. I also promote collaborative interactions with investigators all around the world. Although the choice of these great guys was not done via logical thinking, all of them have been very innovative in their scientific field and they all tried hard to understand the world by the study of microbes, physics or mathematics. Copyright © 2013, Damien F. Meyer. All Rights Reserved. This site has been made by Nicolas Guelle.